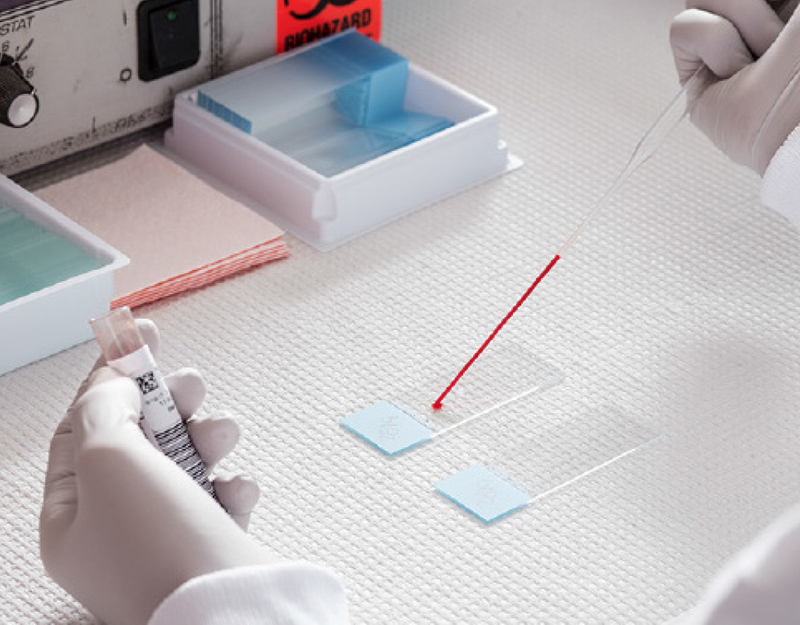 Genoptix offers several ways for our customers to order oncology diagnostic testing services. Contact us to set up an account today. Call +1.800.755.1605 or email: clientservices@genoptix.com. Making payments and viewing statements is easy. Genoptix offers MyLabBill, a convenient service for patients and healthcare providers to view and manage their Genoptix medical bills and invoices online. Genoptix prides itself on being able to offer our clients world-class customer service. Call +1.800.755.1605 or email: clientservices@genoptix.com. 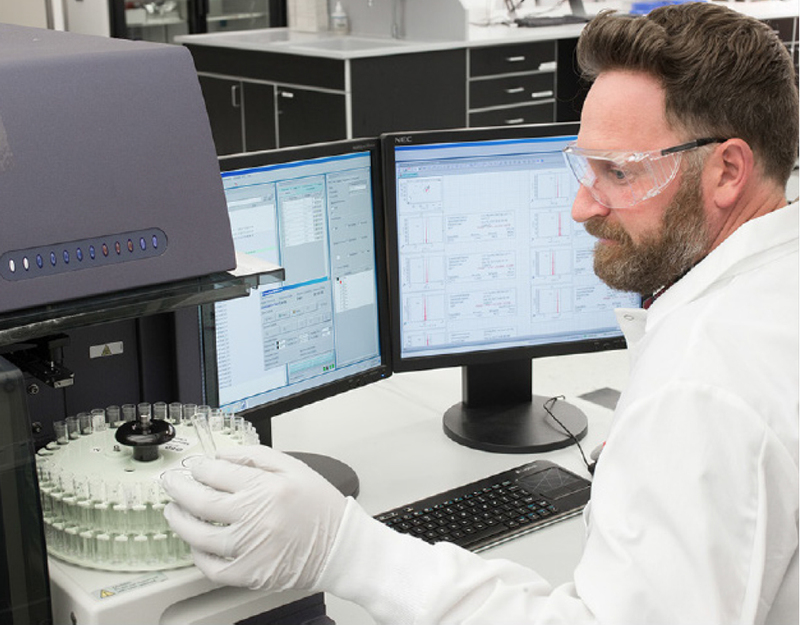 GENOPTIX PIONEERED PRECISION MEDICINE IN ONCOLOGY WITH NEXT-GENERATION SEQUENCING AND UNIQUE SERVICES SUCH AS COMPASS® AND CHART®. WE CONTINUE TO ARM PHYSICIANS AND PATIENTS WITH INFORMATION IN THEIR FIGHT AGAINST CANCER, ONE PATIENT AT A TIME. Our team of 20+ board-certified hematopathologists, molecular pathologists and geneticists evaluated over 600,000 samples and created over 1.6 million lab reports since 2005. Since its launch in 2012, we have accessioned over 46,000 Next-Generation Sequencing samples. Genoptix is a CAP-accredited and CLIA-certified oncology laboratory. That’s the kind of experience you need to get the best results for your patients. Morphology is the microscopic evaluation of the visual appearance of cells, searching for abnormalities in size or shape. Immunohistochemistry (IHC) is the process of staining cells utilizing labels that bind to specific proteins. The presence or absence of staining indicates the type of cell, and may suggest a disease state. On its own, IHC may not be enough to make a diagnosis, but in conjunction with morphology, it is a critical initial step for proper diagnosis. We have a continuously expanding catalog of over 200 IHC stains, useful in the assessment of such diseases as leukemia, lymphoma, breast cancer and lung cancer. Our predictive and prognostic stains include estrogen and progesterone receptors, HER2, Ki-67 and PD-L1 for immunotherapy. Flow cytometry is a cornerstone diagnostic tool used in hematology screening. We use advanced instruments and laser technology to measure properties of cells and detect cancer cells in a sample of bone marrow, blood, or lymph node. After the sample is treated with fluorescent antibodies, it is scanned with a laser beam. If the antibodies are attached to the cells, they will give off light that helps quantify and identify the cell types. This most often provides a differential diagnosis for leukemia and lymphoma. Genoptix also uses this robust technology for assessment of clonal evolution, paroxysmal nocturnal hemoglobinuria (PNH) and minimal residual disease (MRD) for B-cell acute lymphocytic leukemia (B-ALL), chronic lymphocytic leukemia (CLL) and multiple myeloma (MM). 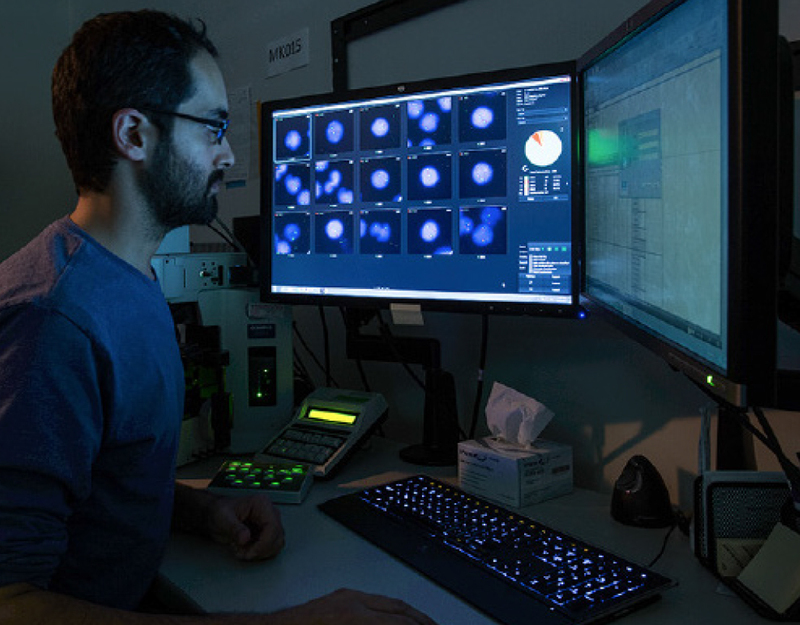 For many diseases, cytogenetics provides the next layer of information at the genomic level. Our cytogenetics lab performs karyotyping and fluorescence in situ hybridization (FISH) for disease markers and specific genetic and chromosomal anomalies. This is important because chromosomal analysis of leukemias, lymphomas and solid tumors may reveal abnormalities that will impact a patient’s diagnosis and treatment plan. Molecular testing may be used to help classify the disease and/or match the best treatment to the type of tumor. 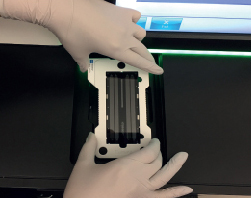 We use the most advanced genetic analysis and sequencing techniques including polymerase chain reaction (PCR) and next-generation sequencing (NGS). They are useful in the analysis of diseases such as myelodysplastic syndromes (MDS), acute myeloid leukemia (AML), chronic lymphocytic leukemia (CLL), chronic myeloid lymphoma (CML), myeloproliferative neoplasms (MPN), colorectal cancer, central nervous system (CNS) cancer, lung cancer (NSCLC) and melanoma. Genoptix is one of the largest specialty oncology laboratories in the U.S. We provide community and hospital physicians with comprehensive testing solutions in hematology and solid tumors. Our company was built on providing the latest medical expertise with the most advanced technologies to help physicians make the right clinical decisions. Every day, we help patients and their families by providing the best information to help them on their journey in their fight against cancer. Genoptix is acquired by Novartis, Inc.
EVERYTHING YOU NEED, ONE CLICK AWAY. 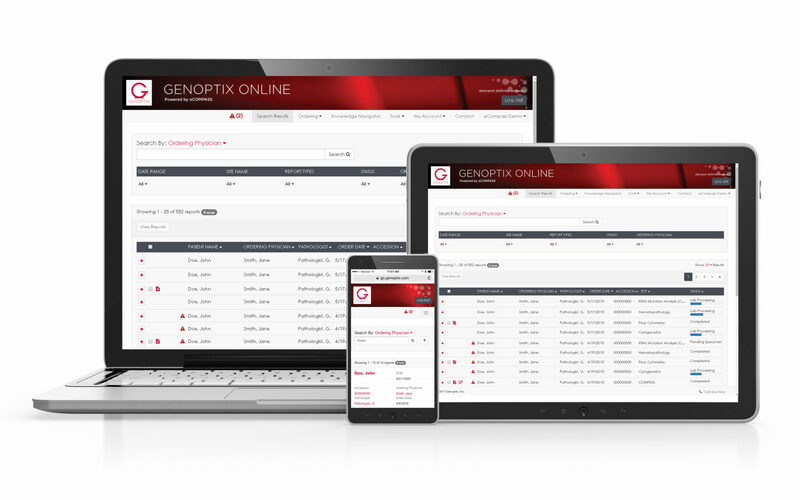 Genoptix is committed to providing solutions that simplify and streamline your workflow via our Genoptix Online® web portal. You can now quickly and conveniently order and receive reports on hematology and solid tumor testing online, and gain access to other helpful resources enabling you to focus on what matters most—the patients you serve.